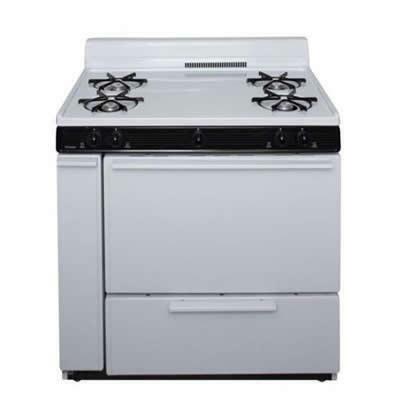 Prepare multiple dishes at once with this Premier 36" freestanding gas range that features a 3.9 cu. ft. oven capacity and 2 adjustable racks for customizable interior space. Four 9,100 BTU burners provide plenty of heat for efficient cooking. Additional Information Lets you quickly cook foods separately from what's inside the oven; Our home delivery teams or installers are required to install an antitip bracket at no additional charge. Refusal of antitip bracket installation results in a drop-off only delivery, no connections will be completed; Safely maintains a temperature for an extended period of time in order to comply with kosher cooking practices. Additional Dimensions Height with backsplash 40 inches.